Las Vegas. Sin City. The place where drunk marriages and Elvis priests are in abundance. The setting of the first (and best) Hangover film. 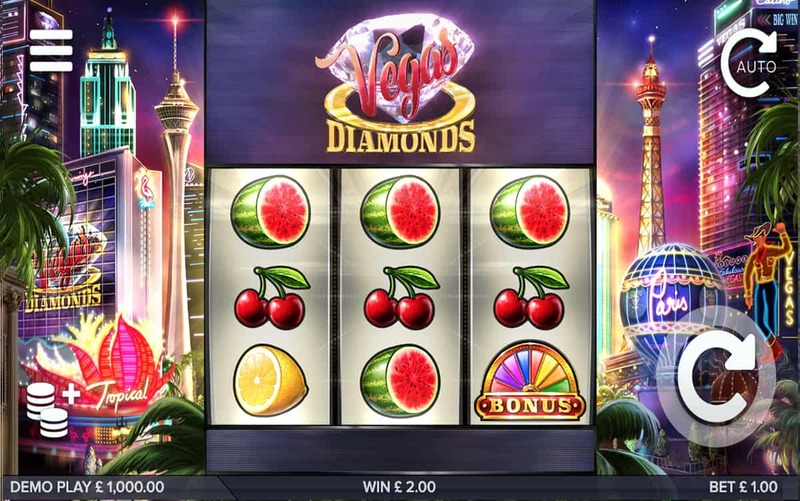 Even better than all of these is that Las Vegas now truly comes alive on the Vegas Diamonds Slot from award-winning slots developer ELK Studios. With retro slots making a comeback, ELK dips its proverbial cap to classic Vegas action as it gives us traditional slots play with more than a touch of Vegas magic. Vegas Diamonds is everything we expect from Las Vegas. From the minute the slot loads up, we zoom straight to the Strip, with all the iconic landmarks on the side. Fireworks blast on screen and the soundtrack begins in a celebratory mood, something which continues as we play. The reel case is set in the middle of the screen, with the top third featuring a screen that almost advertises Vegas for tourists. We see Caesar’s Palace, a wedding chapel and other famous scenes, intercut by the Vegas Diamonds logo. Underneath this, the three game reels open up a world of promise. 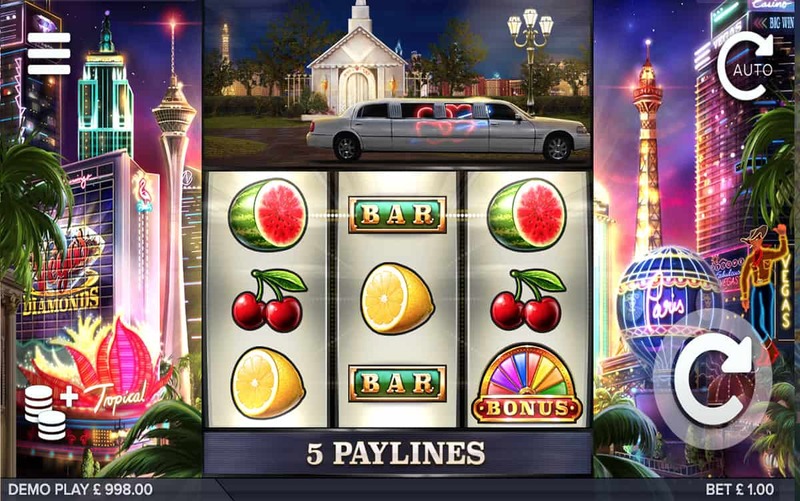 With traditional slot symbols such as Bars, Watermelons and Cherries, it’s a mixture of fruit machine meets Vegas. And we love it. All in-game instructions are easily found by buttons that fade in and out so as not to interrupt our play, meaning we can sit back, relax and enjoy a taste of Vegas. Vegas Diamonds is a deceiving slot. You might be mistaken in thinking that it’s a basic game due to its three reels and five paylines. However, if you think that then you’re very much mistaken. All the extra features more than make up for the smaller reel and payline numbers. Take, for instance, the Vegas Diamond Symbol, which awards 30 times our stake when it appears three times across a payline. And we can encourage this by using the auto nudge feature to our advantage, making any three Diamond symbols appear on the centre payline to guarantee a top-paying win. 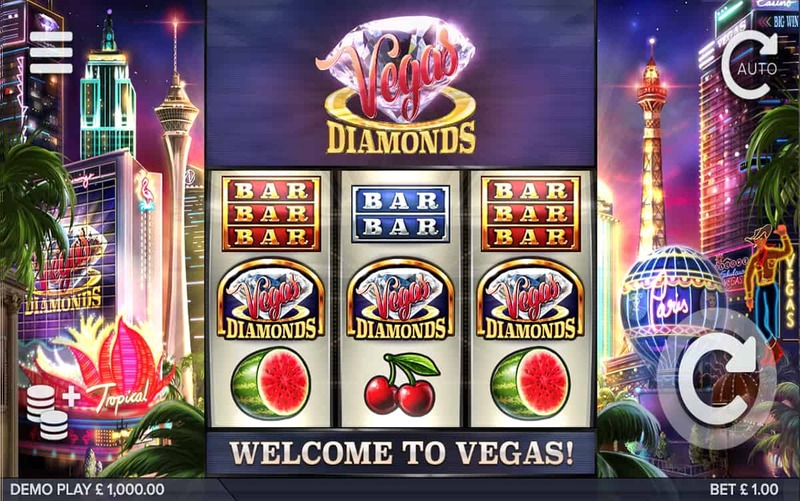 Instead of a conventional Free Spins round, Vegas Diamonds gives us the Vegas Diamonds Fortune Wheel. We trigger this bonus round when we land three Bonus symbols anywhere on the reels. The wheel will be shown at the top of the screen and has three levels, bronze, silver and gold. On the bronze wheel we can win up to x100 our stake, while this score ramps up to x1,000 on the gold wheel. If we land on the Free Spins section then we get five Free Spins with a 5x Multiplier on all our wins. Like many other studios creating nostalgic slots, ELK has thrown its hat into the ring. Except it’s got a much bigger, snazzier, diamond encrusted hat. We don’t just get to experience Vegas. On the Vegas Diamonds slot, we live, breathe, spin and win Vegas. The combination of gameshow and classic slot machines make this slot a once-in-a-lifetime Vegas experience.